Almost exactly a year ago, Microsoft and Adobe announced a strategic partnership around Microsoft’s Azure cloud and Adobe’s Marketing Cloud. That, however, was only a first step for the two companies. Today, they are announcing a major expansion of this partnership that sees them collaborating around e-signatures and team communications. 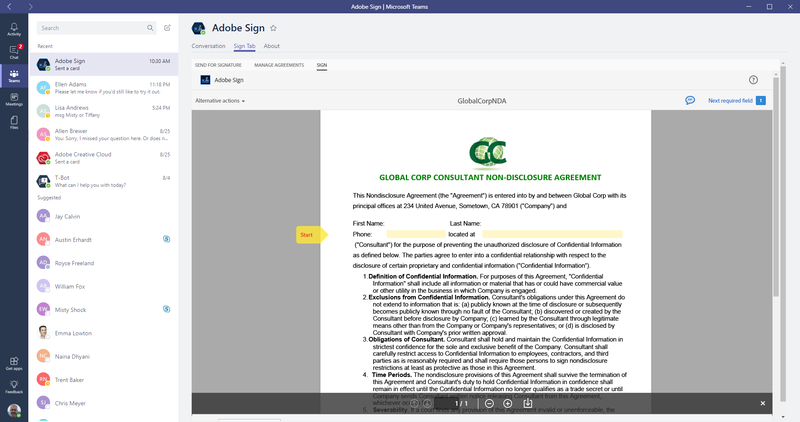 Specifically, this expanded deal means that Adobe Sign will become Microsoft’s preferred e-signature solution, with integrations into Office 365 and Dynamics 365, while Microsoft Teams — the company’s Slack competitor — will become the preferred collaboration service for the Adobe Creative Cloud, Document Cloud and Experience Cloud. Microsoft will also integrate Adobe Sign into services like its workflow automation service Flow, and the Microsoft bot framework will be able to talk to Sign, too, to check on the status of an approval process, for example. And when a user drops a new template into a specific Creative Cloud folder, Flow will also be able to see this and automatically route the document through the approval process. Similarly, Adobe will also make Microsoft Azure its preferred cloud of Adobe sign. This means Adobe’s Creative Cloud tools, for example, will see deep integrations into Microsoft Teams. 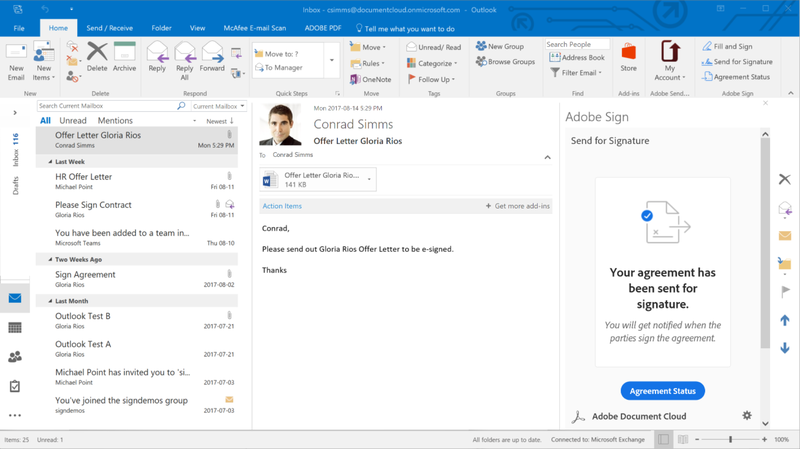 The Adobe Sign integration with Teams, Flow, Word, PowerPoint and Outlook will go live in the coming weeks. The Creative Cloud integration with Microsoft teams will also launch soon, with the integrations into the Adobe Experience Cloud following after that. Adobe’s Jon Perera, the company’s VP of product development for its Document Cloud, told me that he expects this deal will also make other Adobe products, including the likes of the Adobe Stock stock imagery marketplace, more discoverable, and will hence drive more users to it. The two companies also expect to do a lot of joint enterprise customer engagements and campaigns.